In these vegetable juicing recipes you will find drinks that will revitalize you, help cleanse your digestive system and boost your vitamin and mineral intake. If that isn’t enough vegetable juicing recipes will also provide you with delicious healthy drinks that you’ll just want to make time and time again. If you are fortunate enough to have a vegetable garden then juicing provides a wonderful way to use crops that have grown in abundance. It’s always best to use seasonal vegetables if you can as they are the most nutritious and by buying in season you get better value for money. So here are a few of my favourite vegetable juicing recipes. This juice combines the sweetness of peas and melon with the tangy taste of ginger. Sugar snap peas are really enjoyable when eaten raw in salads and therefore work equally well when juiced. Start by chopping the ginger. Remove the seeds and skin from the melon and cut into chunks. Push the sugar snap peas (in their pods) through your juicer followed by the ginger and melon. Serve chilled on ice. This should make 1 large glass. This powerful little red drink is packed full of punch, which is guaranteed to revitalise your flagging energy levels. The combination of smooth tomatoes and carrot juice with a chilli kick will supply you with vitamins A, C & E all of which are essential for good health. Roughly chop the tomatoes and chilli (don’t forget to remove the chilli seeds if you prefer a more mild chilli flavour). Scrub or peel the carrots. 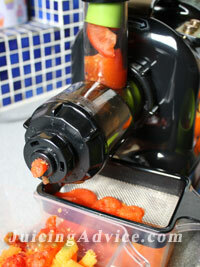 Pass the carrots, chilli and tomatoes through your juicer. Juice your orange. Combine both juices and pour over ice. Using beetroot enables you to make one of the sweetest vegetable juices as it full of natural sugars. For me its also one of the prettiest looking juices as beetroot maintains its beautiful deep red colour when juiced. Just be aware that beetroot juice can easily stain your clothes if you are a messy juicer like me! Trim off the beetroot stalks and scrub clean. Cut into quarters and pass half of the beetroot through your juicer. Then add the chopped ginger followed by the rest of the beetroot. Squeeze the orange using a hand juicing tool and mix with the beetroot juice. Serve immediately over ice. 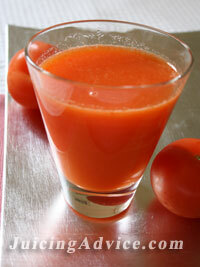 This is another juice that can pack a punch as it contains red chilli. This fabulous drink can be easily prepared in a blender and makes a great appetizer if your inviting friends round for a barbeque. Start by skinning your tomatoes, roughly chopping the cucumber, spring onion and celery. 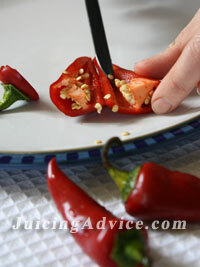 Remove the seeds from the pepper and chilli and then roughly chop them. Add all of these ingredients into a blender and blend until smooth. Add the coriander and blend again. Add the juiced lime and a pinch of salt to taste and pour over ice. It’s rather like a smooth salad in a glass. I hope this has given you a few more vegetable juicing recipes to add to your repertoire. Return to our main page on juicing recipes.